Mei, Orisa, McCree, and Brigitte have also been adjusted. Overwatch’s Halloween Terror 2018 event has started, introducing a ton of spooky cosmetics and map changes to the Blizzard first-person shooter. But a whole swath of hero changes have been added to Overwatch, too—ones that could change the game’s meta. Colorblind options were added in the update. Players are able to customize how team colors are displayed on their user interface. Hero outlines can be changed to one of nine different colorblind-friendly options. All the options are viewable in the video section of the menu. Blizzard’s targeted a lot of heroes in this update, including Torbjörn, Brigitte, and Pharah. Here are the patch notes. Developer Comments: The health of Brigitte’s barrier was extremely difficult for most heroes to deal with even as she was able to close the distance with her targets. This change still provides Brigitte with substantial survivability but should also be more rewarding for opponents who pressure her. Developer Comments: Previously, the cooldown of McCree’s Combat Roll felt too restrictive, which sometimes prohibited players from using it. The new, faster cooldown should allow for more flexibility when choosing between using it for mobility or an instant reload. Developer Comments: We wanted to increase how responsive Pharah’s Rocket Launcher felt. Having almost a full second of recovery between shots made it feel sluggish. To balance out the improved recovery time, we shifted some of the damage from the rocket’s explosion to the direct impact damage. The overall damage potential is now increased when landing direct hits and decreased slightly when only dealing explosive damage. We reduced the amount of knockback each explosion causes, as they made it very difficult to aim at Pharah while rockets came in at a faster pace. The Concussive Blast cooldown reduction should allow the ability to sync up more closely with the Jump Jet cooldown when used for mobility. Developer Comments: Orisa spends a significant amount of time firing her Fusion Driver from a relatively stationary location and the weapon’s spread value caused it to feel too random when leading targets at a distance, taking into account the projectiles’ travel time. We’ve tightened the spread slightly, which should leave her close- and mid-range damage potential largely unchanged, while making it feel better to try to hit targets at longer ranges. Developer Comments: Soldier: 76’s damage output was a bit low but not too far off from where we feel it should be. Making it take a few more shots to reach max spread smooths out the weapon spread curve and should help his damage be more consistent. 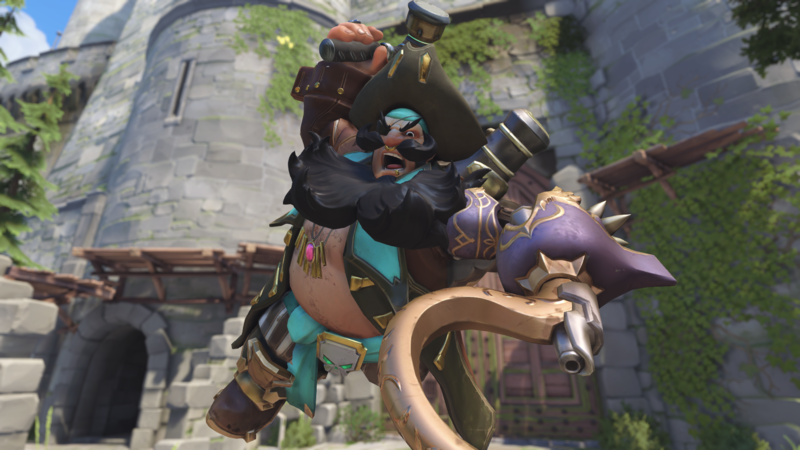 Developer Comments: Torbjörn was initially designed to be a specialized hero, intended to be a strong defensive option due to his armor-generating capabilities and ability to control areas with his turret. However, the scrap collecting and Armor Pack mechanics have proven to cause problematic gameplay issues through their feast or famine nature. In order to make the hero more flexible in a wide variety of situations, we’ve removed the scrap system, made the turret much easier to deploy, replaced the Armor Pack ability with Overload—a powerful self-buff—and transformed Molten Core into a powerful new area denial ultimate ability.